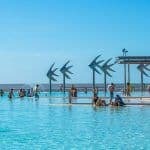 Are you looking for cheap Tweed Heads accommodation or one of the great Tweed Coast Holiday Parks with plenty of family friendly facilities? 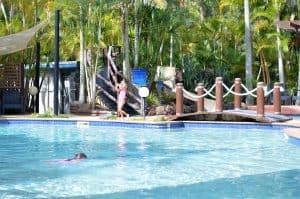 Then look no further – the Big 4 Tweed Heads, or Big4 Tweed Billabong Holiday Park as its officially called, has everything you need to entertain the kids for a few days. 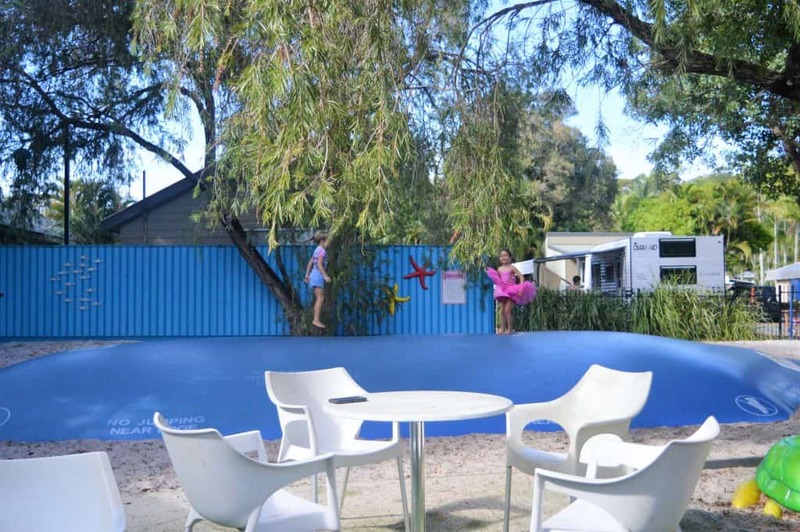 Big 4 Tweed Billabong Holiday Park is an ideal holiday park for families with children of all ages. 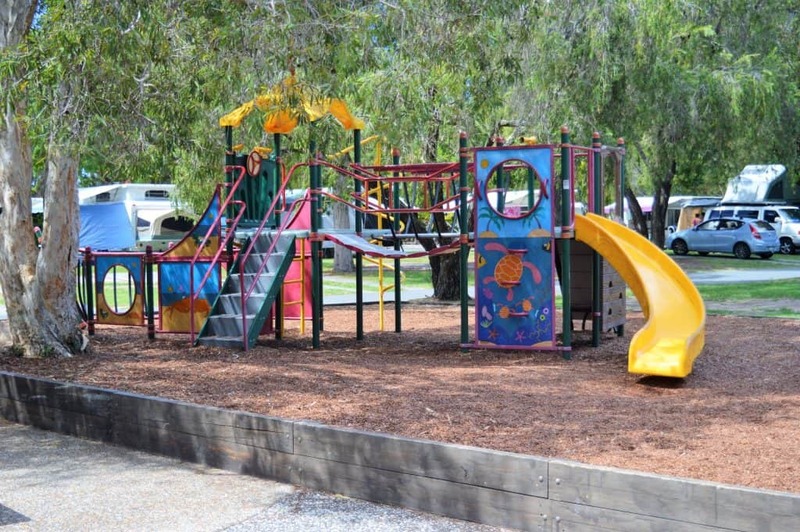 The park has awesome activities to keep the kids entertained for hours as well as fantastic kitchen and lounge facilities make feeding the kids a breeze for Mum and Dad. 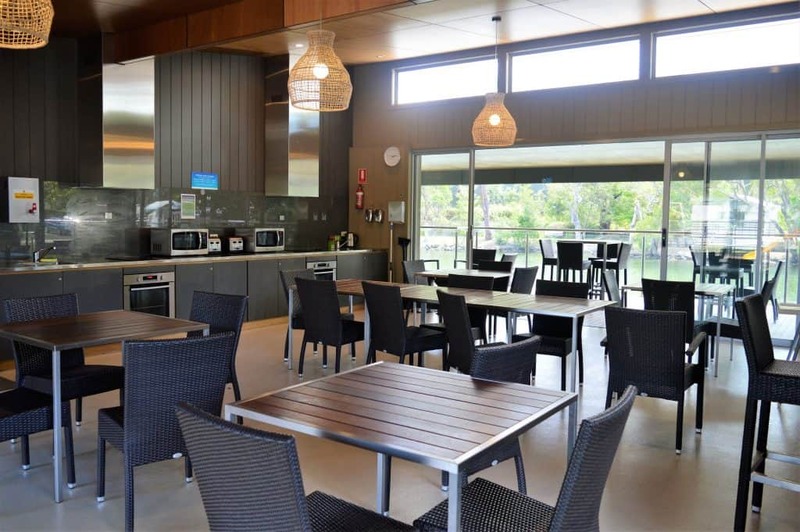 Whether you are into spending the night in a sleeping bag or prefer more permanent accommodation, the Big 4 Tweed Heads has got something suitable for you. 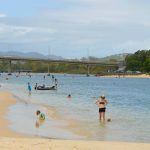 The Tweed Heads Billabong is a huge water hole ideal for swimming and various other activities like fishing, kayaking and stand up paddle boarding. 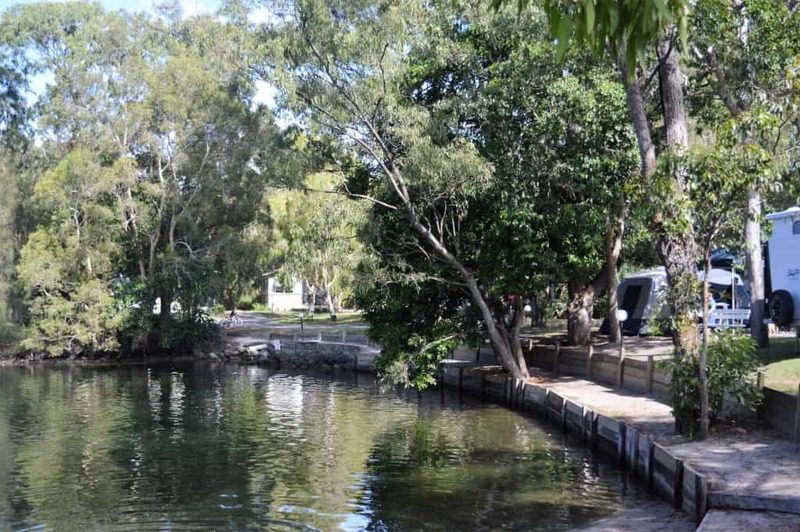 Some of the camp sites and cabins look right over the billabong – check these out below for more information. 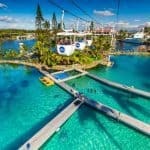 Located in the middle of the Big 4 Tweed Billabong are two different floating trampolines for the kids to try out. You can either swim or kayak out to them. 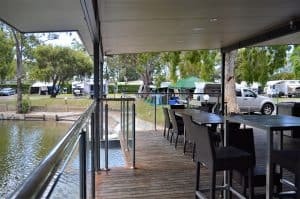 If you are into fishing you will love being able to fish straight from the Big 4 Billabong. You can catch mullet, bream, flathead and mangrove jack from the Billabong with prawns or even bread. You can purchase bait and hire fishing rods from the reception. Fishing rods are $4 AUD for 2 hours. Looking for more destinations for weekends away with the family? Check out our post on Bundaberg. Bring your own or hire kayaks and stand up paddle boards from the reception. Kayaks cost $6 AUD or 2 hours and stand up paddle boards are $5 AUD per hour. Lifejackets are also provided for the kids on request. We spent the majority of our time in the pool, also known as Lizzy’s Lagoon. 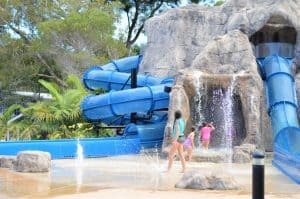 Big 4 Tweed Heads has 2 pools right next to each other, one with a small waterslide for the kids and the other includes a spa. There is ample of seating around the pool, including some very comfy lounges which I just loved chilling on! On Saturday nights in Lizzy’s Lagoon the Big 4 Tweed Heads plays kids movies. On the night we were there the movie was Epic. Don’t forget to pack some popcorn! Coral Cove is a small indoor play area for the younger kids. It is advertised for under 6’s, but I think the area is better suited to children under 4 years of age. Still a great place for the parents to take the little ones who need some space away from the bigger kids. Myla loved this one – it’s a huge jumping pillow which kids around her age just adore. It’s not very high and the area around it is sand which is great if the kids fall off. 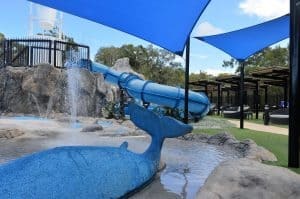 There are 2 separate playgrounds in the Big 4 Tweed Heads, one next to the jumping jelly fish and one located by the kitchen / lounge area. Our camp site was right next to one of these playgrounds which was great to be able to watch Myla from our camp site. The waterpark is fantastic!! It’s just like wet and wild on a tiny scale! 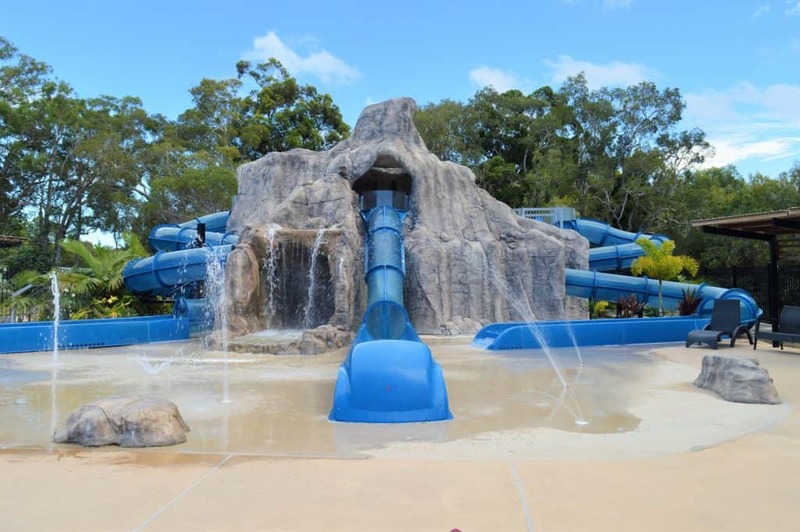 There are 4 water slides, a giant tipping bucket and even a toddler area. 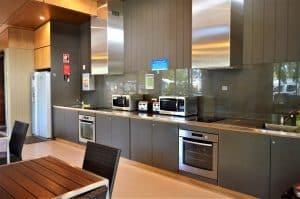 There is heaps of seating for the parents, toilets and even BBQs if you want to cook up some lunch whilst the kids are occupied. 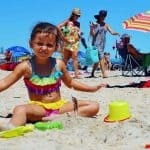 Seriously your kids will never want to leave!! You can hire pedal powered go karts to ride around the Big4 Tweed Billabong Holiday Park. The park has both single and double go karts for $10 per hour and there is also a 4 seater family go kart for $8 per 30 minutes. Kids under 7 must ride with an adult and an adult must drive the family go kart. Helmets and shoes must be worn whilst operating the go karts. Kitchen complete with ovens, hot plates, fridge/freezer, microwave and toaster, hot water boiler and sinks for washing up. 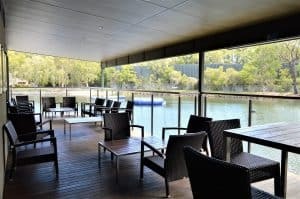 Dining area with seating for 30 including a huge deck looking out over the billabong and additional seating looking out to the playground. Lounge complete with TV, internet, book exchange and fire place. 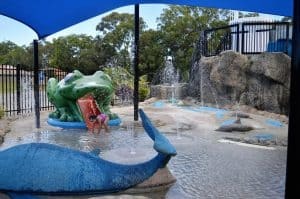 The Big 4 Tweed Billabong Holiday Park has a super clean amenities block which even includes a family bathroom complete with a large bath – ideal for washing small children. There is also a bathroom in each of the men’s and ladies’ toilets with an extra-large shower area, chair and hand rails for those needing a little more help. For long term campers there is also a laundry with washing machines, dryers, sinks, ironing facilities and an outdoor drying area. 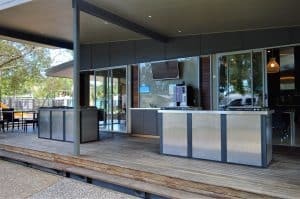 In the reception area of Big4 Tweed Billabong Holiday Park there is a small kiosk for purchasing anything you forget to bring or to grab some snacks for the family. Items for sale include soft drinks, milk, cereal, sunscreen, insect repellent, bread, newspapers, chocolates , ice cream and heaps more. 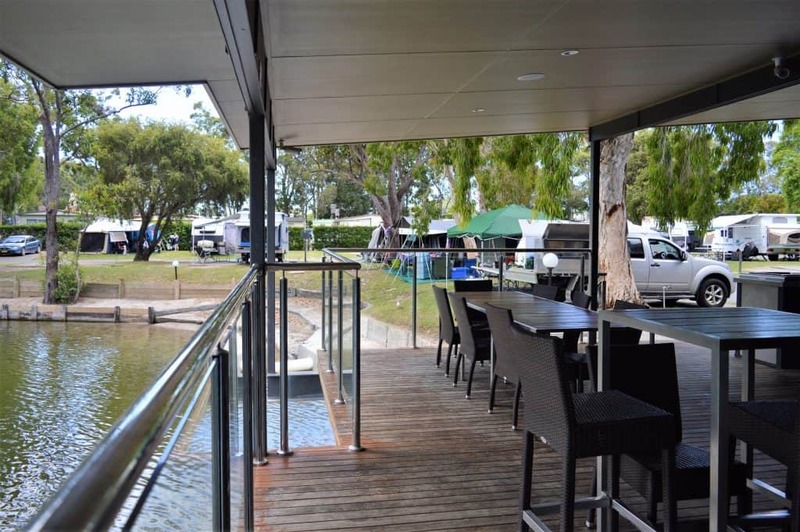 Big 4 Billabong offers fantastic Tweed Heads accommodation with plenty of different options from sites for tents, caravans, motor homes, camper trailers to self contained cabins. All of the Big 4 Billabong sites are powered. Ensuite Sites – include private bathroom facilities and TV connection. Prices start from $57 AUD per night. Caravan Sites – includes driveway and TV connection. Prices start from $45 AUD per night. Powered Sites – large areas, away from all the main amenities so much quieter, and includes TV connection. Prices start from $45 AUD. 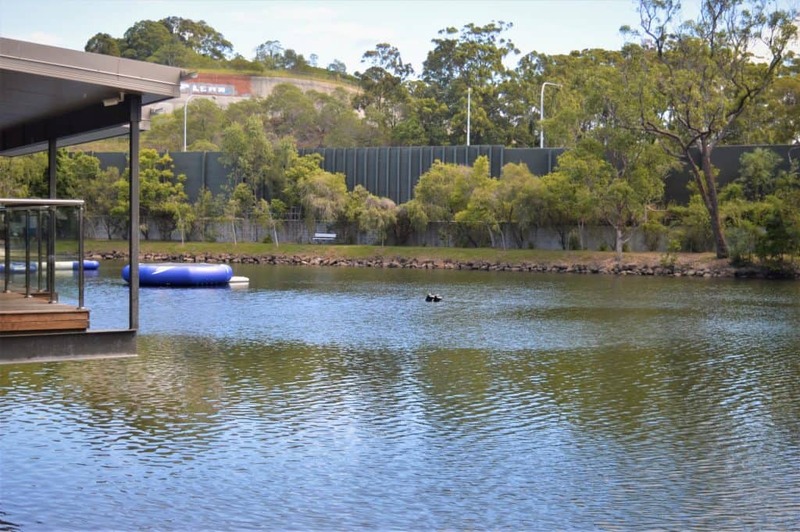 Billabong Sites – smaller areas right near the billabong and all the main amenities. Prices start at $45 per night. 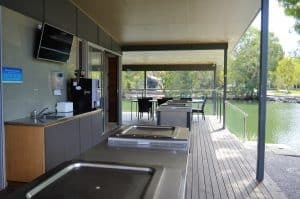 Coolabah Cabins – fully self-contained, 2 bedrooms, spa, overlooking the billabong. These cabins sleep up to 5 people and prices start from $180 AUD per night. Matilda Cabins – fully self-contained, 2 bedrooms, close to all the amenities. These cabins sleep up to 6 people and prices start from $170 AUD per night. Banksia Cabins – fully self-contained, 2 bedrooms, close to all the amenities. These cabins are smaller than the other cabins, but can still sleep up to 6 people and prices start from $155 AUD per night. Jumbuck Cabins – fully self-contained, 2 bedrooms, spa, close to all the amenities. These cabins sleep up to 4 people and prices start from $165 AUD per night. For the latest prices for camp sites and cabins check out booking.com or Expedia. 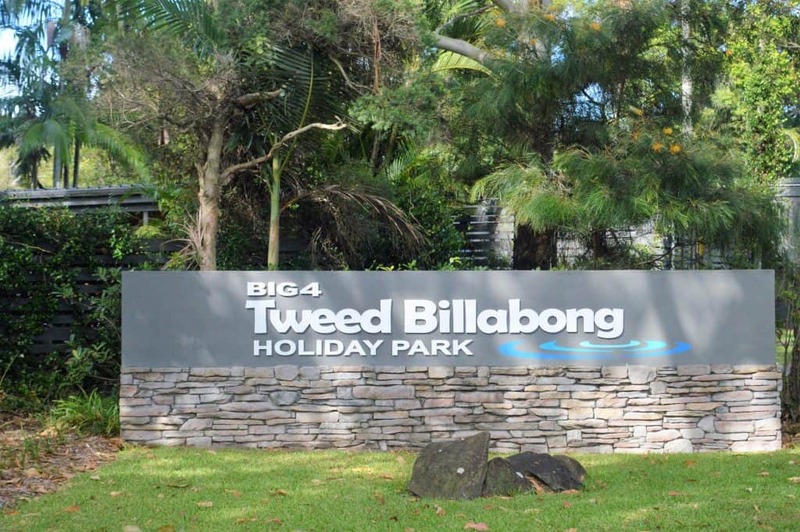 Big 4 Tweed Billabong is located in Tweed Heads. 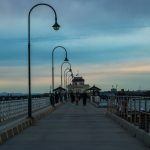 Close by are beaches, shopping centres, and cinemas. Mount Tamborine is also easily accessible from the park. 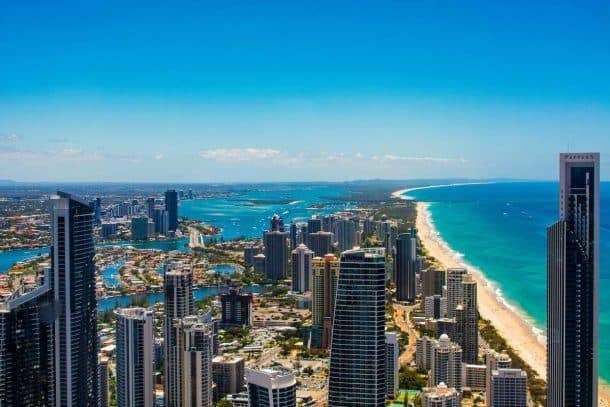 If you are flying in the Gold Coast airport, the park is only 6.5 kilometres or 10 minutes drive away. We found the staff at the Big4 Tweed Billabong Holiday Park super friendly, which is not always standard these days. All of the park’s grounds, facilities and amenities were super clean and made the whole stay that much more enjoyable. Another thing I liked about the park is that for $30 AUD you can purchase a late check out and stay until 4pm instead of their usual 10 am check out. This means you can get up and enjoy the parks facilities rather than jumping out of bed and scrambling to pack up the tent and get out by 10am. 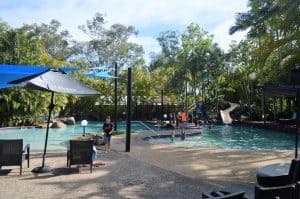 We thoroughly enjoyed our weekend at Big 4 Tweed Heads and highly recommend it for families seeking an easy camping experience with loads of activities for the kids. 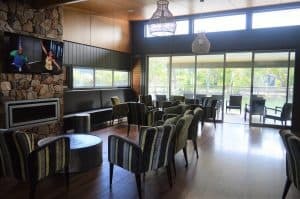 Have you stayed at the Big 4 Tweed Heads? Let us know your favourite activity in the park in the comments below? Wanna save this for later? Pin the image below to Pinterest. 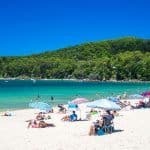 Planning a trip to Queensland? Or just want some ideas on short breaks? 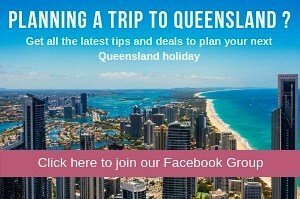 Let us help you plan the PERFECT, STRESS FREE, BUDGET friendly trip to Queensland for FREE!! 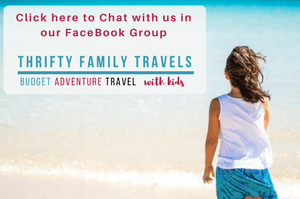 We will send you everything you need for an awesome trip - itineraries, hotel suggestions, budget guides, getting around or just some inspiration on short getaways and day trips. 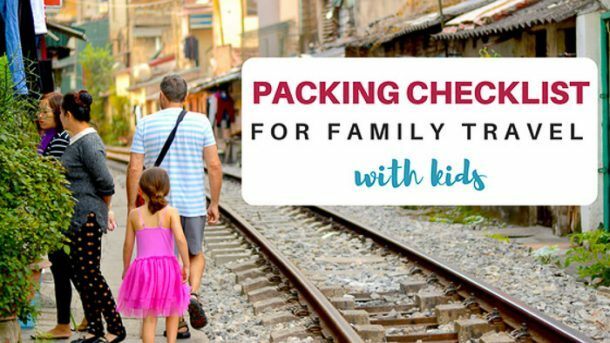 PLUS you can download our packing checklist immediately. Awesome - lets go to Gili! !